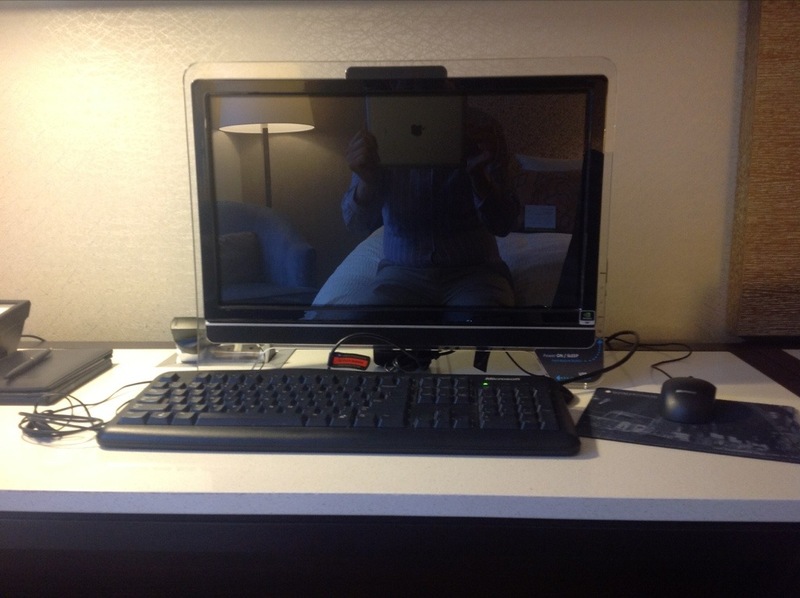 This is my review of the InterContinental Times Square hotel in New York. This is the penultimate part of my review of my recent US trip. Previous articles in this series cover the Sheraton Frankfurt Airport, the Lufthansa First Class Terminal, the Swiss First Class Lounge, Swiss First Class in the air, the InterContinental Boston and American Airlines domestic service from Boston to New York. 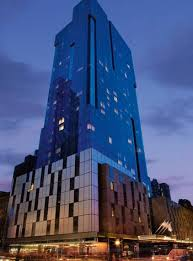 I booked myself two nights at the InterContinental Times Square. One night was on IHG Rewards Club points (50,000 per night) and the second was using the free night voucher for spending £10,000 on the Priority Club Black credit card. My Ambassador membership got me upgraded to a ‘skyview’ room on the 26th floor. Last time I was here I had a corner room, albeit on a lower floor, and the room this time felt smaller than I remembered. 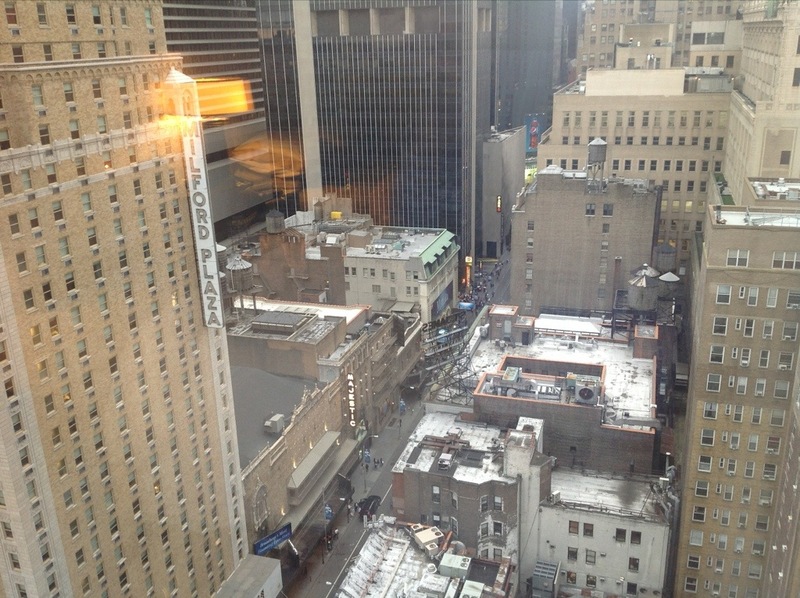 In reality, for New York as you can see from the photos, this is a decent sized hotel room. After my stupendous corner junior suite sized room in Boston, it was always going to be a let down! Even on the 26th floor, you are lower than most of the surrounding buildings. And it is still pretty noisy! 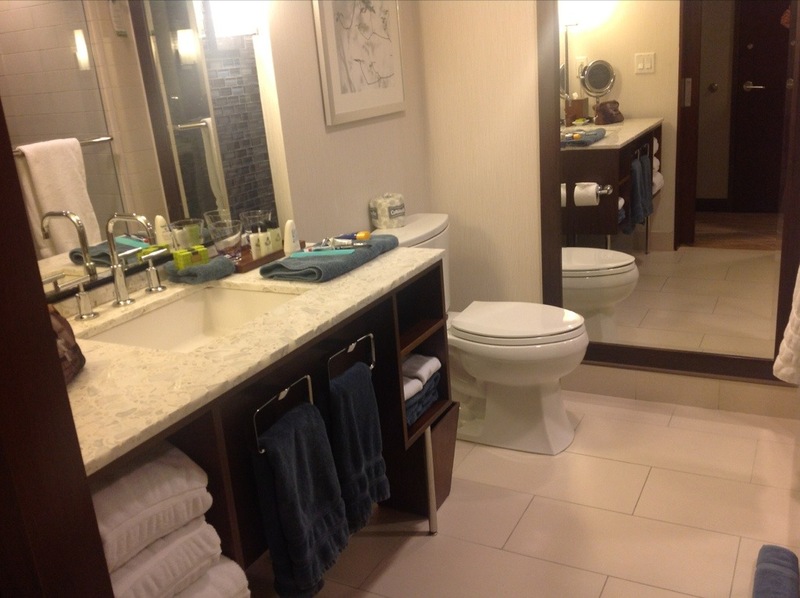 The bathroom was nicely furnished, but there was no space for a bath, only a rainfall shower. The snazziest thing about it is the PC in every room. It is $12.95 per day, but you have access to a proper working computer and mouse, for a decent daily rate. It came in very handy for working on HFP posts. Like Boston, as an IHG Rewards Club elite member, the free internet (wi-fi, you still need to pay to use the PC) was high speed and not the rubbish 512mb restricted version some hotels are offering. Did my Ambassador status pay off? Well, oddly, I was given a letter at check-in listing all the Ambassador benefits, but with a disclaimer at the bottom saying they don’t apply on reward stays! However, I was upgraded, I got the free fruit and mineral water, I got the free New York Times and I got the 4pm check-out! That only left the free pay TV movie, and I didn’t bother with that. The location is good coming or going from Kennedy airport. The SkyTrain at the airport drops you on the E subway line. 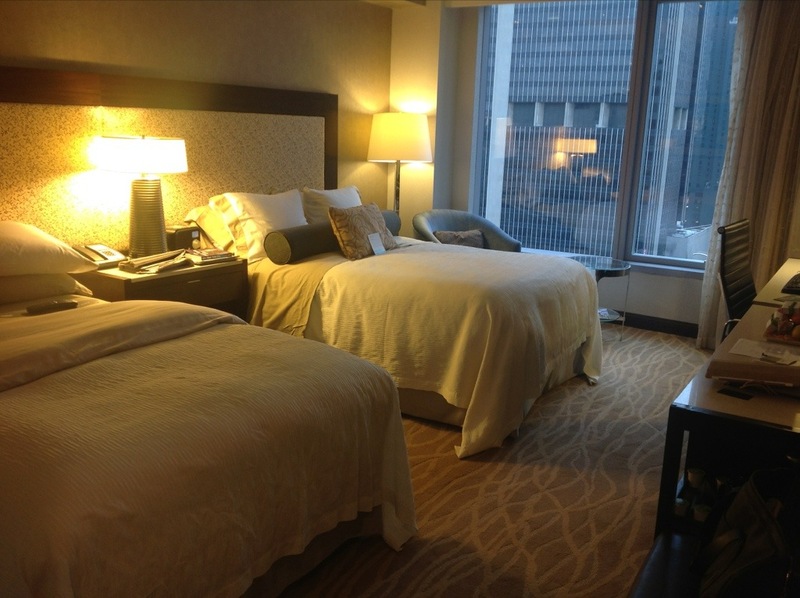 Get off at 42nd Street, exit via the 44th Street exit, and the hotel is directly next to you! It couldn’t be easier. Total door-to-door travel time is about 1hr 20mins. It is actually 2 blocks west of Times Square, so you miss the worst of the human congestion in the area. It certainly isn’t as serene as the Battery Park location of the new Conrad New York where I stayed in February. High-end eating is good, with a Todd English restaurant (a US ‘brand’ chef) and a Shake Shack for burgers in the building. No shortage of options for breakfast if you don’t want to pay the hotel prices – and at $29 plus 18% service plus 9% tax, you probably won’t. What the InterContinental Times Square REALLY lacks, though, is public space. The lobby area is very small, and that is it. There is nowhere for people to gather or hang out, nowhere to put decent artwork, nowhere to put a shop. There are some sofas, but they are technically inside the restaurant and seem to act as a waiting area in the evening. Basically, its a bed factory and little more. A very nice, very well appointed, very modern bed factory, but that’s it. Soho House remains my accomodation of choice in New York, but as I was only in town for 36 hours and my wife wasn’t with me, it seemed crazy to pay for a room. You can find out more about the hotel, and book, on this page of the IHG website. I stayed here a couple of years ago and thought it was a pretty nice hotel and location. I’ll always remember this hotel for what happened when we left though. We told the guy at the door we were walking to the station. Last minute we decided to grab a taxi from outside the hotel. We put our bags in and got in. The door guy was literally jogging alongside the taxi as we pulled off begging for a tip. I’m there in few weeks using my PC Visa free night and a very good deal it was too!! I’ve been unsure about transport to JFK but your post has resolved that for me – thanks. Yes, easy. Get off at 42nd Street on the E. Walk towards back of train, go up last flight of stairs, keep walking down corridor in same direction you were walking (it is a long walk!) and the 2 exits at the end both bring you out at the hotel. Thanks again. I ‘ll have a biggish suitcase – it isn’t 1 of those steep 60 step stair jobs is it? No, only one fairly short flight from platform to corridor then 20 or so steps in a short flight to the street.